Astrea’s Women in Leadership Agenda panel gave me hope | What would George think? Kayleigh Woods Harley from Birkbeck’s Strategic Programmes Directorate discusses the Astrea network’s recent International Women’s Day event, and what it means to take a collaborative approach to tackling gender inequality. One month on from International Women’s Day, what, if anything, am I hoping for? LinkedIn Editor Felicity Menzies commented that “the one change I’d like to see in the workplace is a shift from fixing women to fixing the system.” It echoed my thoughts exactly on the reasons why we needed a cross-College panel event on the Women in Leadership Agenda. The big question is: how can the system be fixed? It’s a huge question that no one in any industry I’ve come across has sufficiently answered. As a grassroots initiative, Astrea is a professional development initiative for women working in professional services and support roles. Managed and run by nine women who volunteer their time away from their normal jobs in External Relations, the library, project management, student advice, admissions, administering schools and departments, dealing with student complaints, and all manner of other roles, Astrea is grounded in the Birkbeck ethos of striving for better, of goodwill. But its existence alone does not equal gender parity. Astrea continues to receive College funding to host 6+ internal events each year. Yet there has never, until now, been an event open to all staff: women, men, professional service and academic staff. Judging by the range of women and men in the audience, there is a desire across Birkbeck to engage with the problem and seek ways of overcoming inequality, including at management level. 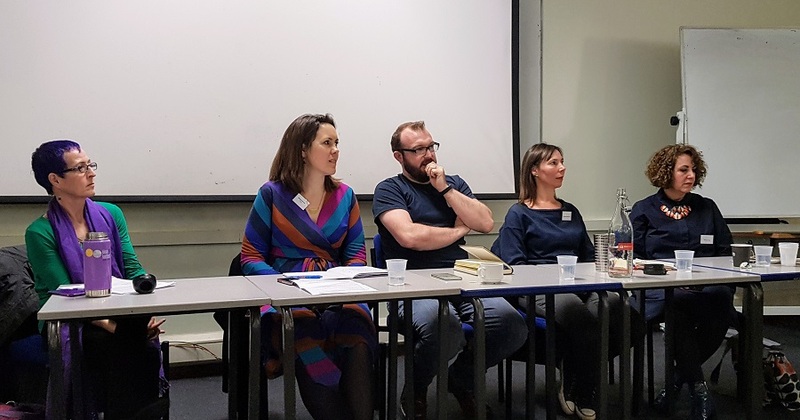 Kicking off the panel event on 8 March, the College Secretary, Keith Harrison, confessed that there was much more that Birkbeck could do to attain gender equality. This theme was picked up by the panel members themselves, expertly chaired by Birkbeck’s own Communications Manager Bryony Merritt, comprising two academics and two UK politics-affiliated people: Jane Holgate, Professor of Work and Employment Relations at Leeds University Business School; Luke Holland, a communications consultant who recently worked for the Labour party; Birkbeck’s own Professor of Geography, Rosie Cox; and Deborah Day, a senior civil servant who also champions women’s digital skills. While all acknowledged that workplaces had changed for the better during their careers, they also pointed out that there is still a considerable distance to be travelled and all had a different take on how that should be achieved. Deborah offered some stark views on the world of technology. While women comprise half the British workforce, technology, the bedrock of our daily lives, is predominantly a male industry. Technology firms are just not recruiting enough women. This results in products and services that are inherently designed to disadvantage women, creating a worldwide digital gender divide. Jane has worked in male-dominated industries throughout her career. She began in the heavy-drinking macho culture of the print industry and is now one of only 9 female professors (out of 100) in her faculty. Actively involved in trade unions and conducting research into their historical development, Jane sees grassroots networks as the most valuable asset for making a difference to individual women’s lives, especially when considering intersectionality. Luke, being the only male representative on the panel, offered his perspective on Labour’s achievements in getting true representation in Labour’s elected members. Luke advocates men and women making a strong case for equality in their workplace, raising awareness and calling out injustices where they are seen. It also requires mentoring, monitoring and accountability. The Welsh Labour party has legislated for its goal of becoming a “feminist government”. Even if it is a goal that is doomed to failure, it should be pledged anyway, because equality should be a guiding mission for all organisations. As an expert on gender and work, and co-founder of the research centre Birkbeck Gender and Sexuality, Rosie had some positive things to say about Birkbeck’s internationally-recognised research on gender and its guiding mission. But she pointed out that there are many things the College can do to improve: it’s not about “fixing the women,” it’s not about a deficit model, and it’s certainly not about simply ticking boxes for Athena Swan. She called on leaders to recognise that good intentions are simply where the hard work really starts; the next step is to push for real change, even if that change is disruptive. It is important to take an intersectional approach, since white middle-class women have recently begun to see benefits but their BAME counterparts are still being left behind. Rosie also highlighted the benefits of equality at all levels. She argued that if an organisation is not promoting staff based on merit alone, then the chances are it is discriminating against all manner of characteristics, whether protected or not. This would include discrimination against unconventional people, or those who do not conform to Western standards of attractiveness, male or female. At heart, the equality agenda is about building an organisation that is utterly fair, that serves everyone’s interests, even if they don’t think so. The depth of the discussion on the panel, carefully managed by Bryony, reassured me that I am not alone in believing that real change is not yet upon us, but also hope that things may be changing. Momentum, awareness-raising and a shift in attitudes are all contributing to the demand for change, and recent reporting on Birkbeck’s equality pay measures shows that there is ongoing investigation into the causes of the pay gaps and potential solutions to them. It simply remains for us all to maintain pressure in our workplace to ensure that it results in positive actions. If you attended the Women in Leadership Agenda panel event, please leave us a comment and let us know what you thought. Such a great summary of a really thought-provoking event. Thanks, Kayleigh! So much yet to be done!